WHILE there are mechanisms in place to monitor the proposed deep sea tailing placement system, there is nothing in place to monitor discharge that is being allowed to flow freely into the Ramu River system. This was one of the many admissions made by the officers from the Department of Environment and Conservation during a day-long awareness meeting on the DSTP which was conducted in Madang last week. The issue of the “free-flow” into the Ramu River was raised during the meeting by former chairman of the Kurumbukari Landowner Association Toby Barre. Mr Barre said he understood a lot of soil erosion had taken place and what was of concern was the effect, if any, this was going to have on the river system, especially as a lot of this was a result of the blasting exercise which had been conducted using explosives. “The blasting exercise involved the use of explosives which we know contains chemicals. Our concerns are that a lot of these chemicals may now be in the river system. “If so we have a lot of people who depend on the river system for their sustenance and livelihood. Has your office started monitoring this? If it hasn’t how does it intend on going about this exercise?” he asked. DEC acting executive director of the environmental protection wing Michael Wau admitted that the department had not done enough to monitor discharge into the river system. He said one of the reasons why this had been allowed was manpower shortage. Mr Wau said these responsibilities lay with the project developer to monitor these discharges and to report back to them what was happening on the ground. The meeting heard that several landowners living along the Ramu River were seeking to take out an injunction to prevent damage to the river system. Middle Ramu MP and Fisheries Minister Ben Semri who was at the meeting raised his concerns on the mine impact on the Ramu River. “I am concerned about the impact on the Ramu River and how my people will suffer but this is a government project and I will support it,” he said. ARMED security guards and police reservists at the Porgera gold mine in Enga have been blamed for the death a landowner and the wounding of another last week. Police have confirmed receiving news of the death and shooting but could not give further details as investigations were continuing. Reports alleged that the landowner was killed inside the mine site and his body dumped outside the camp last Thursday. Highlands regional police boss Supt Simon Kaupa confirmed that the security guards were also enlisted as police reservists. He was yet to receive a report from the local police force in Porgera. Acting Porgera police station commander Snr Sgt Poko Itapa confirmed the killing and shooting but could not say much because investigations were continuing. He said a landowner chief was allegedly shot by security guards as villagers fronted up at the company gate to inquire about the death of their relative. Landowner chairman Mark Tony Ekepa told The National in a phone interview that relatives of the victim had protested outside the community affairs office last Friday at about midday. However, he claimed Barricks security guards fired into the crowd and wounded Nixon Mangape, the chief landowner and chairman of Porgera Development Authority. He said Mangape was trying to control the crowd and was not involved in the protest. Police said that the empty bullet shells were found at the site of the shooting and were tendered in as evidence. Porgera’s Paiam Hospital chief Dr Granda Granada said a person was rushed to the hospital with a bullet wound at the back of his buttock but was discharged after treatment as it was not severe. He also confirmed that a body, found near the mine site, was brought to the hospital prior to the shooting but declined to comment further. He said a post-mortem and x-ray results indicated a fractured neck bone and believed that the person could have died from blunt trauma, particularly caused by blunts things like sticks, metal or rocks. The landowners said last Friday’s incident was not the first involving live bullets. They said that numerous complaints had been lodged with the PNG government, the UN Human Rights Commission that included various reputable institutions around the globe. “Shooting to death of defenceless landowners is serious human rights abuse. “Therefore, the Porgera Landowners Association calls on the PNG government and local NGOs to investigate the shooting and to allow law to take its course,” Ekepa said. As indigenous landowners in Papua New Guinea step up their campaign against pollution of the Watut river by Harmony Gold and Newcrest Mining, and villagers along the Rai Coast hold fast to their injunction stopping marine dumping from the Ramu nickel mine, disturbing photos of the impact of BHP Billiton’s Ok Tedi mine in Western Province have been posted on the internet. 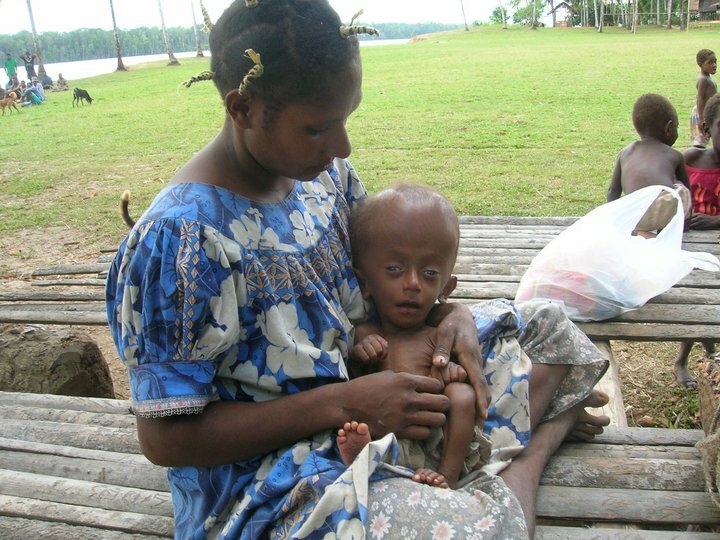 It is photos like these, that graphically show the human suffering that can be caused by the dumping of mine waste, that bring home the real cost of Papua New Guinea’s rush to exploit its mineral resources and the impact of allowing large transnational corporations to ruthlessly exploit the inadequacies of PNGs regulatory regime. As long as the government is the unashamed promoter rather than the unbiased regulator of the mining industry and as long the Department of Conservation continues to rely on the company scientists to evaluate their own plans then its is the women and children of Papua New Guinea who will continue to pay the human price for others wealth. The bribery accusation against Zijin Mining Group, China’s largest gold mining group, stemming from its attempts to cover up a sewage spill was approved by the central government recently. The General Administration of Press and Publication (GAPP) also confirmed that none of the journalists involved accepted the hush money. In the early July 2010, a leak in the sewage tank in the Purple Mountain Copper Mine, which is owned by the Zijin Mining Group, led to 9,100 cubic meters of sewage being spilled into the Ting River and resulted in the death of 3.78 million kilograms of fish in the river, causing serious environmental pollution in neighboring regions. But the Zijin Mining Group attempted to hide this severe incident at first. Investigations from the GAPP showed that after the pollution incident was exposed, the Zijin Mining Group indeed tried to give envelopes with money to reporters and journalists to keep them quiet, but those reporters who were involved all rejected the bribes immediately, refunded the money or turned it over to their head offices for evidence. On July 16, reporters from the Shanghai Securities News and the Xiamen Evening News each received two envelopes with 2,000 yuan cash inside in hotels where they lodged, but the two reporters returned the money to the company immediately. A similar incident also happened to a reporter from the 21st Century Business Herald on July 16, who immediately pushed the man sent to deliver the envelope out of the room. On the evening of July 16, a reporter from People’s Daily also received an envelope with 2,000 yuan cash inside. The reporter immediately reported it to the headquarters and returned all money back to the company through municipal departments of Longyan City, Fujian Province, where the company is located. From July 12 to July 20, reporters from China Business News refused bribery money several times as well as accommodation and travel arrangements when conducting interviews in Shanghang County, Longyan City of Fujian Province, where the company is located. On July 16, a reporter from China Business also received an envelope with 2,000 yuan cash inside, the reporter immediately reported to the headquarter and handed all money to the headquarters to preserve evidence without managing to return the money back immediately. The Zijin Mining Group, however, issued a statement on its official Web site on July 29, saying that the company neither incited any person to give hush money to reporters over the sewage spill incident, nor did the company spend any such costs. Zijin Mining Group Co., Ltd., produced 30.65 tons of mineral gold in 2009. Based in China’s Fujian Province, it is high-tech, benefit-oriented and the largest domestic gold mining group centered on the exploration and development of gold and base metals. It listed in Hong Kong Stock Exchange in December 2003 and issued its A Shares in April 2008, the first of its kind in China’s A-share market. The Ting River, which also known as the mother river of the Hakkas, a unique ethnic group of “Han” Chinese originally active around the Yellow River area, flows 300 kilometers from Changting County in western Fujian Province south to the port and Special Economic Zone of Shantou City, Guangdong Province. The majority of Chinese netizens expressed their condemnation of the contaminating company and demanded it be held legally responsible for its misconduct. If anyone was wondering whether Papua New Guinea can trust its government to monitor and regulate the activities of multi-billion dollar resource projects, the Department of Conservation has provided the answer – very clearly NO. They can’t even manage a simple presentation! Australian based-Marengo Mining says it plans to dump mine waste from its proposed Yandera Gold and Copper mine into the pristine Basamuk Bay in Papua New Guinea’s Madang province. It’s Madang’s second deep sea tailings placement system, similar to the Chinese-owned Ramu Nickel mine which plans to dump slurry waste into the same bay. Landowners have successfully got a court order and delayed the Ramu mine from constructing a deep sea waste pipeline. Marengos Managing Director, Les Emery says its plan is yet be approved by the PNG government. EMERY: Marengo is currently undertaking a definitive feasibility study on the Yandera project in Madang province of course, and that study is due for completion by the end of this year. And obviously there are a number of ways of disposing of the tailings and we’re looking at all of those options, both land-based and deep-sea tailings to see which is the most effective from a long-term stability point of view in an area where we’ve got high rainfall and high seismic activity, and also obviously from a community aspect what has the least effect on the community, least effect on the environment, and of course the economic parameters otherwise if you don’t consider the economics in your project then the mine will never go ahead. NANOL: Has the proposal for the deep sea tailings placement system, has it been already submitted to the Papua New Guinea government’s department of environment and conservation for approval or not yet? EMERY: No look that’s far too premature to even suggest that. As I said we’re still completing a feasibility study into the viability of actually of the mine going ahead at all and obviously that’s a major study that’s been underway for … by the end of the year it would have taken almost three years to complete, and quite a lot of money. So there’s been no formal go-ahead of the mine at all and even then it’s subject obviously to the financing of the project, which is currently estimated to cost of one-point-six-billion US dollars. So there’s been no applications of any sort, either the special mining lease application or the environmental permits attached to a mining program. That would all happen in 2011. NANOL: So how is the exploration going? EMERY: Well the feasibility study’s focussed on developing a Copper-Molybdenum mine. There’s only a small amount of gold produced as a by-product out of the copper concentrate. But the feasibility study’s going very well and that’s on schedule. NANOL: When would the mine come into production and how long will the mine lifespan be? EMERY: It’s a big project and as you can imagine spending one-point-six-billion US dollars. So if the go-ahead is given some stage next year it would be about a two-and-a-half to three year project to construct and commence. So it would mean that some time around 2014 we’d be in full production of copper and molybdenum concentrates. NANOL: And the lifespan would take how many years then? EMERY: We are currently developing a mine plan with a minimum of 20 years, but obviously over that period of time the company would continue to drill the project and expand the resource base. So I tend to sort of take the view that a 20-year mine life is the minimum life, but it’s a 20 year going on 30 years plus. NANOL: Mr Emery there’s been opposition by landowners at the Basamuk and Madang against the Chinese owned Ramu Nickel mine dumping mine waste into the Basamuk Bay, and the proposed deep sea tailings placement by Yandera and Marengo is even closer to that same area. Don’t you think there will be double trouble for the people and more opposition from the Madang people and the landowners? EMERY: Certainly from Marengo’s perspective what we’re looking at is developing a long-term operation which will have major economic benefits to Madang province and the people within it. Obviously everything we do and will do in the future has to meet the highest environmental standards and be accepted by the communities. NANOL: But the landowners they’re asking the Chinese developers to look for a different disposal waste disposal system. Is Yandera looking at other alternatives and options apart from the deep sea tailings? EMERY: Yes part of the study includes land-based tailings storage as well, and that’s a requirement for environmental permitting, that the company considers all options. But at the end of the day the project has to look at what is the best long-term solution from a stability of tailings given the high rainfall and seismic activity, land-based tailings over the longer term have some effects on the environment and communities, so we are considering all options. MCC, the Chinese government corporation that is building the Ramu nickel mine in Papua New Guinea has been all across the local media in recent days lamenting the terrible consequences of a landowner injunction that is preventing the construction of the mine’s waste disposal system. The company went to court last Friday, August 20th, to try and get the injunction lifted. Dr George Shou, Design and Construction Manager for MCC, told the court in a sworn affidavit that if the injunction was not immediately lifted then the construction of the mine waste dumping system would have to be delayed until next April because on the upcoming wet season that would prevent any construction work. MCC’s General Manager, Development and Planning, Mr Wang Hongxu, gave very similar evidence. 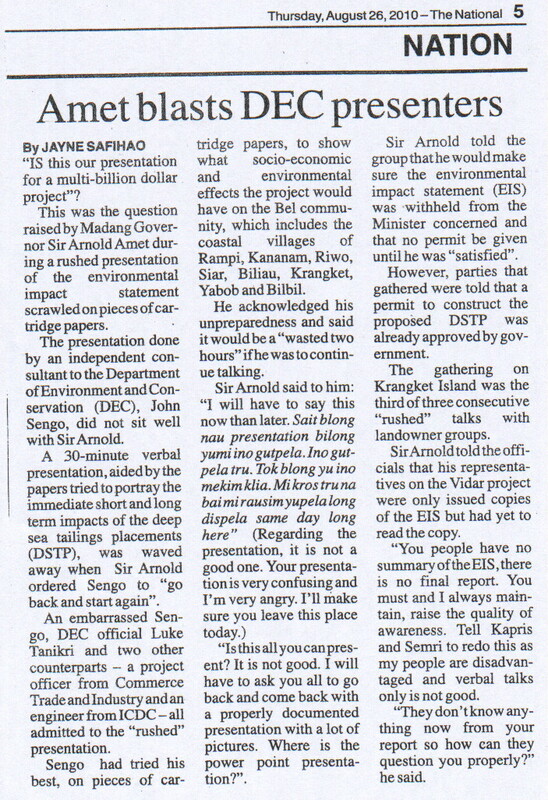 He told the Court, if the waste disposal system is not constructed by October then, even if the injunction was lifted, the crucial commissioning programs would have to wait until April next year because of the wet season and the project timetable would be hugely disrupted and the impact on the mine’s viability could be disastrous. The message from the company was clear. If we don’t start on the marine dumping system now then we can’t do it until April next year. At least not according to MCC Vice President, Huang Dan. She told a press conference in Hong Kong yesterday, August 25th, that MCC “estimates the Ramu nickel mine will be able to start production by the end of this year”. No mention of the injunction and the impact of the wet season from the company’s Vice President. She is confident the mine will be in production by the end of the year. So where does that leave her local Manager’s Wang Hongxu and George Shou? Let’s hope they were not lying to the court…. Or maybe no-one told Vice-President Huang Dan that Justice Canning refused to lift the injunction? But one thing is clear, they can’t all be right and that means someone is not telling the truth.